If the sanctum is the heart of the Mandir, the murtis – or sacred images – are its very soul. All activities of the Mandir revolve around these Deities and are the focus of all forms of worship – from the daily arti, thal and abhishek, to the weekly assemblies and year-round festivals, as well as darshan and other devotional acts of individual worshippers. The term ‘murti’ is derived from the Sanskrit word ‘murta’, meaning embodiment. A murti is therefore more than a physical representation of God or a meditational aid, but a receptacle (or ‘vessel’) for the living presence of the Deity. This is ensured by the meticulous design and crafting of the image according to ancient Hindu scriptures, and through a set of elaborate Vedic rituals performed by the enlightened guru, whereby each part of the image is ceremoniously infused with the presence of the Deity. Without the Deities, the Mandir would be no more than a beautiful building. With them, it becomes a sacred place of worship wherein God resides – the home of God. Since God is often conceived as the king or lord reigning supreme over his creation, it is natural that this home is befittingly majestic. That is why the murtis are housed in ornate shrines replete with gilded, decorative thrones, called sinhasans. In fact, the presence of the Deities in each sacred image means that they are served and looked after just like a real living sovereign. This includes their ceremonial wakening, bathing, dressing and adorning, greeting with honour during times of audience, offering of food, and resting. Trained sadhus (Hindu monks) attend to the Deities with a deep sense of reverence, adoration and meditative awareness. Integral to the sacred images enshrined in the Mandir is the theology of the Swaminarayan Sampradaya. It forms the very foundation of a longstanding tradition of such mandir-building stretching back to Bhagwan Swaminarayan himself. He revealed almost 200 years ago: “It is so that upasana [correct theological worship] is upheld that I have built such mandirs” (Vachanamrut Gadhada II 27). To learn more about this theology, please click here. This practice of revering the sacred images of God and divine personalities is called murti puja. Click here to learn more about this core Hindu concept and how it helps Hindus to establish, express and enhance their relationship with God. 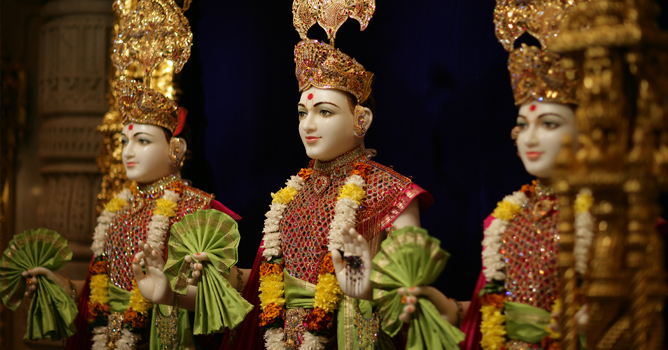 To learn more about each murti in the various shrines of the Mandir, please click here.